Measures of the antioxidant capacities of 277 selected foods were released today by Agricultural Research Service (ARS) scientists. The new database provides easy access to antioxidant values for a wide variety of foods, many of which may be excellent sources of healthful compounds. The database will be used by scientists to help guide ongoing research into how antioxidants may correlate to health benefits. For example, many fruits and vegetables are known to be good sources of antioxidant vitamins, such as E, C, and beta carotene, a form of vitamin A. But these natural foods also contain other compounds, collectively known as phytonutrients, that may contribute to health. The database was prepared by ARS researchers at the Nutrient Data Laboratory, part of the agency's Beltsville Human Nutrition Research Center (BHNRC) at Beltsville, Md., in collaboration with colleagues at the ARS Arkansas Children's Nutrition Center in Little Rock. ARS is the U.S. Department of Agriculture's chief scientific research agency. Many of the fruits, nuts, vegetables and spices listed were analyzed for their Oxygen Radical Absorbance Capacity, known as ORAC, at the Arkansas center. 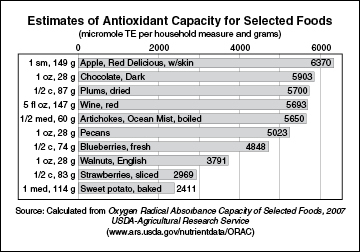 ORAC is one of a number of methods available to evaluate the antioxidant capacities of foods. The method was developed by ARS chemist Ronald Prior with colleagues. Prior also studies the ability of antioxidants to be absorbed and utilized within the human body. Data on foods analyzed using the ORAC method were also gathered during an extensive search of peer-reviewed, scientific literature, and screened through a USDA-developed, data-quality-evaluation system. Both the screened data and the analyzed data are listed in the database, along with data quality indicators. Antioxidant capacity measures may vary due to factors such the type of cultivar studied and its growing and harvesting conditions, as well as the methods used for a food sample's preparation, processing, and/or analysis. The new release expands upon the 2004 data release by ARS on estimates of the antioxidant capacity of 171 foods.